ComGeo series of Symposia, a sequel to NUMOG (Numerical Models in Geomechanics), is a multi-disciplinary forum for exchange of views between researchers, engineers and students. The format of this Symposium will be similar to that of previous ComGeo meetings; i.e. limited number of participants, high technical standard and an informal style promoting discussion. 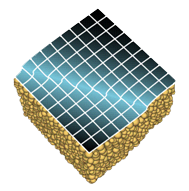 The scope will cover a broad range of research topics in soil and rock mechanics, including developments in computational/analytical techniques, their application to practical engineering problems as well as innovations in experimental testing and interpretation. Original contributions in the areas of petroleum, mining, geo-environmental, nuclear and off-shore engineering, are also welcome. The extended two-page abstracts are due by 1 March 2018. To download the guidelines for MS Word click on the link: Extended Abstracts (MsWord). For LaTeX software please use the files: Extended Abstracts (LaTeX). All extended abstracts will be included in the publication ′4th International Symposium on Computational Geomechanics, Assisi, Italy, 2-4 May 2018 – Book of Extended Abstracts′ which will be available free to download from this website. The printed version will also be provided at the time of registration. There will be no formal proceedings of the Symposium. However, selected papers will be published, after a peer review, in Special Issues of Acta Geotechnica (Springer) and Geomechanics for Energy and the Environment (Elsevier). The meeting will be held at Palazzo Bernabei located at Via San Francesco 18. The building, shown in picture on the left, is close to the Basilica of St Francis. The Symposium will include invited theme lectures presented by distinguished researchers from the field of computational geomechanics. These will be complemented by presentations given by the Symposium participants in two parallel sessions. Ample time will be provided for formal and informal discussions. A detailed program of the Symposium will be available in mid-March. All three airports are roughly the same distance away, but the transport links from Rome and Florence (via train) will be the easiest. Please note that Perugia airport (Umbria International Airport) is not a good option as it is a small airport that has only daily flights to and from Milan. Exit at Cesena (150 km from Assisi) and continue to Perugia (E45) until Assisi exit. Exit Valdichiana until you reach Perugia, continue towards Cesena (E45) until Assisi exit. Exit Civitanova Marche towards Foligno – Perugia until the Assisi exit. Exit Orte, continue on the E45 towards Perugia – Cesena until the Assisi exit. Ticket Office Hours: 1:00 P.M. To 7:35 P.M.
A local bus service (line C) runs from outside the station up into the historical heart of Assisi. 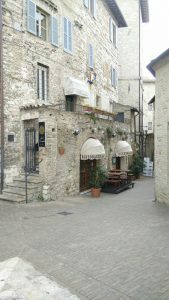 Assisi has a large number of small hotels located within the ancient city walls. 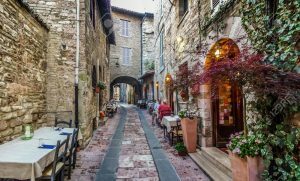 There is also a number of hotels in the adjacent town of Santa Maria degli Angeli which is below the hilltop town of Assisi. A bus service runs between the two towns; the trip takes about 15min. Click on the interactive map provided there to view the location of the hotels. The Palazzo Bernabei is located on the opposite side of the Hotel San Fransceso (close to Basilica of St Francis). 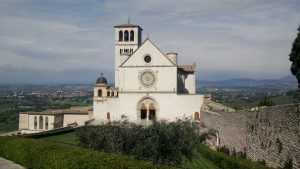 Please note that the traditional spring festival ′Calendimaggio′ will be held in Assisi on 2-5 May 2018 (http://www.amoitaly.com/assisi/calendimaggio.html). During this period, the residents of ‘upper’ and ‘lower’ parts of Assisi put on medieval dresses, and various shows/parades are held in the streets. The main events take place near the Town Hall (Piazza del Comune) in the afternoon as well as in the evening. The festival is quite unique and attracts a lot of visitors from all over Italy. It is strongly recommended that the participants book an accommodation as soon as possible, as the hotels may become full. If you wish to see the night part of the festival, it is best to find a hotel inside Assisi. Otherwise, you may stay in the area of Santa Maria degli Angeli, under the hill of Assisi. Note that the buses from the train station to the center of Assisi finish at around nine o’clock at night. Please clearly identify participant’s name. Registration should be paid free of bank charges, if any. The Symposium registration will take place on May 1st, 4-7pm, at Piccolo Teatro degli Instabili, Via Metastasio, 18. The registration will also be possible at the Symposium venue (Palazzo Bernabei) on May 2-3, 8-10am. 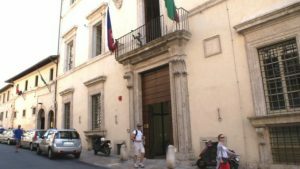 The lunches will be served at Palazzo Vallemani, which is on Via San Francesco 10, a short walk from the conference venue. The reception will be held on May 2nd at the Valle di Assisi Resort in Santa Maria degli Angeli. It will include a brief tour of the winery, for those who are interested. The conference dinner will be on May 4th at Castello di Petrata, located on a hill 5km from Assisi.